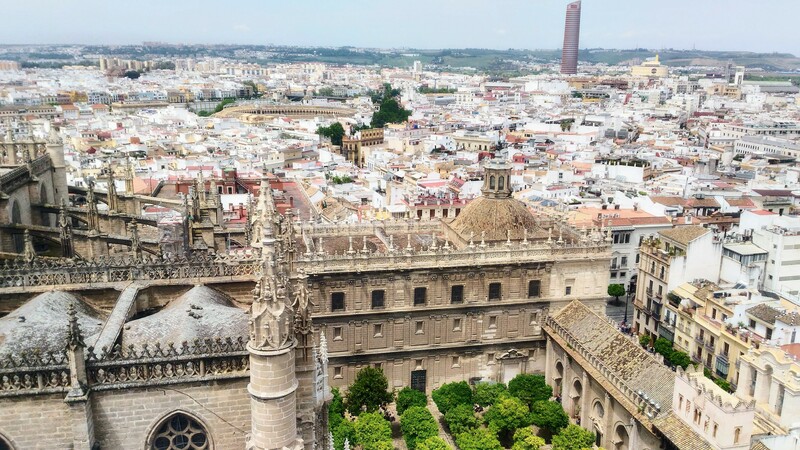 When I started planning for Sevilla, the thing I worried about most was getting there. Flying internationally, having a layover in a Spanish airport, keeping track of my checked bag, locating the apartment of my host family– this is what preoccupied me. Honestly, I didn’t think much about what life would be like after I arrived in Spain. Fortunately, my lack of expectations turned out to fit perfectly with the Spanish culture. An important Spanish phrase that we learned in orientation is sobre la marcha, which means something like play it by ear. Instead of having fixed plans or expectations, Spaniards often like to make it up as they go. It’s a good phrase to describe what this first week of living in Spain has been like. 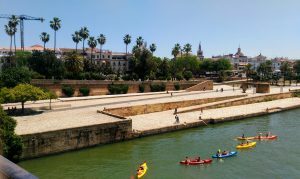 When we arrived in the city of Sevilla, the changes were larger and more noticeable. The landscape was strikingly different: palm trees and bright blue skies. In the summer here, the sun shines brightly until at least 9 o’clock at night. 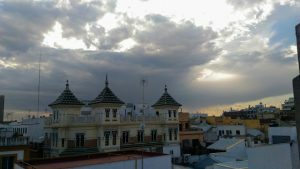 As our taxista drove us towards our street, Calle Evangelista, we noticed a lack of houses. 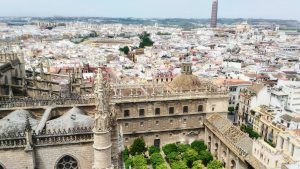 Neighborhoods in Sevilla, we discovered, are made out of apartment buildings, whose ground floors are taken up by small stores– everything from pharmacies to fresh fruit markets to bookstores. But culture differences weren’t the only things I had to learn sobre la marcha. It wasn’t long before my roommate and I were standing on Calle Evangelista with our heavy suitcases, squinting in the bright sunshine and wondering how to find our host señora’s apartment building. After wandering up and down the street a few times (looking like the silly americanos we were), we finally gave up the search and called our señora. In faltering Spanish, I told her the names of two or three stores we were close to; she gave us precise directions for how to reach her apartment. “I’ll be waving at you from the window,” she said before hanging up. That night, after a late dinner (la cena in Spain normally doesn’t start until 9 or 10 pm), I sat on my bed, exhausted and amazed at all the small miracles that filled our long day of travelling: timely arrivals and departures, an available taxi, the fact that our señora actually picked up the phone. If I had known all these things before I left, I might have worried less about the travel, but it would also have been less of an adventure. For me, much of this first week felt like I was learning and living everything sobre la marcha. I didn’t know what my home or neighborhood or classes would be like. Would my phone data work abroad? Would I be able to buy toothpaste? Would I understand any Spanish at all? How much would coffee cost? 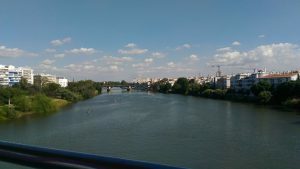 I found out the answers to these questions– yes, yes, yes, and two euros, respectively –not from asking google or my host family, but rather by living out each day. Looking back, I realize that one of the best things I found out sobre la marcha is that this kind of unpredictability can be a blessing. It requires more flexibility, but it also leaves room for a lot of surprise and joy. And if something goes wrong? A second favorite Spanish phrase I’ve learned is no pasa nada— which translates to something like Don’t worry, it’s okay. You’re running late? Lost your way in the city? Can’t think of the Spanish translation for ATM? Ah, pues, no pasa nada. This is something I’ve needed to hear a lot in the past week. And I suspect that these two phrases– sobre la marcha and no pasa nada –will continue to be important for me in the coming week. The beautiful unpredictability of life in Sevilla doesn’t stop here, and I’m excited to see what surprises the next few weeks will hold!